No refund if cancelled with less then 2 weeks prior notice. There's a 250 deposit, payable at arrival. Returned at check out. Porto Spot Hostel is very highly rated here on Hostelworld for its friendly, helpful and sociable staff, who host nightly dinner, guest-recommend walking tours and popular pub crawls. One Hostelworld traveller told us 'the hostel is the right size to get to know everybody staying and big enough to party every night', while many guests say they'd stay here again because of the home-like atmosphere. This hostel is located in Old Town, just five minutes' walk from the Capela das Almas and about 15 minutes from Porto Cathedral. 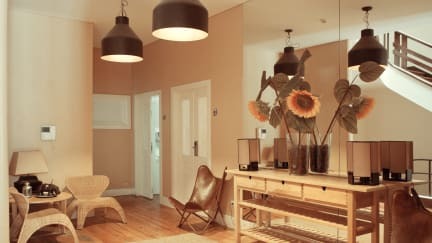 Porto Spot Hostel offers great rooms, great fun in an architectural milestone, fully refurbished for your comfort. Porto Spot Hostel is here to surprise you. Located in the city center, in a 5 min walk from the airport tube, Spot is close to all the beauties of this world heritage city: Clerigos Tower, Old town, Port Wine cellars, night life (at a sound proof distance). Our friendly staff will love to give you all the tourist information, and also those hints you won't find in a guide. The building was constructed in 1935, and was designed by Armenio Losa, well known Portuguese architect. It is one fine example of Estado Novo, a Portuguese style born out of Art Deco. The refurbishment respected the building's originality, adding the expectable amenities of modern comfort. The rooms are spacious, each one with its unique decoration, with key card access, large beds and free security lockers. We also offer you a bar and a nice patio where you can rest at the end of your day, and where we serve our famous dinners daily. A fully equipped kitchen is available, were you can cook your meal if you ever get tired of the fantastic food you will find around town (ask our staff for tips). The living room and the media room will also make your delights. The hostel offers free internet points and free wi-fi is fully available inside the house. We also have a tourist corner where you can find information about the city and its surroundings. Our staff will be more than happy to give you tips on the places you can't miss, and make you a tailor made routing for your stay. In selected days we organise walking tours, for you to get to know those special places only locals know. We also organise pub crawls, to be sure you have the best night Porto can offer. We had a private room en suite and it was great. Breakfast was delicious. The laundry service was prompt and very handy. Pretty central to everything we wanted to do and see! Both the staff and accommodations were amazing. One of the better hostels I’ve stayed in personally. Free breakfast, towels included and spacious private rooms/bathrooms. I peeked into the shared bathrooms as well and they looked very spacious and well maintained. Highly recommend. Love love love all that is!!! If you don't stay there you are missing out. Hugz and kissez to the amazing people that make Porto extra special. Location is great. Walking distance to major sights. Extremely clean. Common areas actually have people hanging out and meeting others. Front desk is amazing. it definitely worth it! I stayed in a three bed dorm and it was gorgeous. Good sized room, locker and key, bedside socket and reading light. Good breakfast included. Clean showers. Friendly and welcoming staff. Stunning building. Would absolutely recommend. Great staff, very comfortable/clean. Breakfast was actually good. Recommend this place! Gorgeous place my solo room with a double bed was paradise after weeks of dorms. Shower was broken, and the hot water gets actually dangerously hot... but great place overall. I think that what puts us ahead of the rest is our outstanding facilities. We've got spacious rooms, large and comfortable beds, huge lockers, numerous spotless bathrooms and a fully-equipped kitchen, not to mention several social areas including a cinema room, a bar, balconies and an outdoor area where we serve breakfast and dinners on the sunny days. The real icing on the cake, though, is our staff. We all really aim to create a home-like atmosphere, with all the information and support you need when travelling. We're centrally located just two minutes' walk from the unique Bolhao Market and five minutes from Capela das Almas and the beautiful Café Majestic. I feel that no visit to Porto is complete without a visit to the Ribeira-the city's most famous and celebrated postcard. Most of our guests are aged 18 to 35 but we welcome anybody that's young at heart.